The Ninth Gate has always struck me as an interesting film, not because of any of the supernatural mumbo jumbo going on – and jeesh does this film never know whether to embrace or mock the mumbo jumbo – but because the plot revolves around a rare book collector on a quest to verify the a very rare book. It’s kind of like a low-key Indiana Jones with books. As Corso begins his quest he begins to be followed by a mysterious woman (Emmanuelle Seigner), and those Highlights puzzles in the book start to be reenacted. There are nine pictures in the book. Since the movie and book itself both have Nine in the title, so maybe they are some sort of key to the puzzle. I don’t know. The film is dense and almost overly so. I have watched the film twice now and haven’t quite got all of the plot points, though I think I got more than on my first viewing. There is something to be said about not dumbing down the film, but being “subtle” to the point of needing a flowchart isn’t always the good either. For example, the Highlights’ pictures in the book get reenacted but sometimes it’s hard to tell which ones happen when and I believe that not all nine pictures are shown on screen so it’s impossible to tell anyway. And as I mentioned above, the film isn’t entirely sure what to do with the occult. The film is largely shows “unexplained” events skeptically, perhaps representing Corso’s viewpoint, yet when the spooky stuff starts happening in an undeniable manner the film starts feeling overly goofy. The director is admittedly a skeptic and wanted to add elements that skewered the detective and supernatural genre, but the end result is wonky. For example, the Highlights events start happening in similarity to the pictures in the book yet they are treated as casually as if someone ordered a sandwich or hailed a taxi. The camerawork is really nice, as is most production design. Sometimes you can tell when something is done on green screen, studio or location, leading to slight tonal shifts that adds to the film’s unevenness, but overall, the decrepit manors and ancient looking manuscripts are effective. How much you like the film will likely depend on how much you are interested in the subject matters. 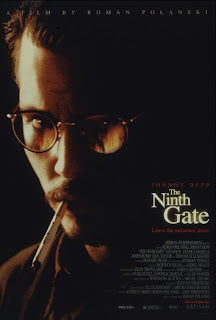 Fans of Johnny Depp (Secret Window) will likely find him amusing in a decent detective/supernatural story. Fans of the director will likely find things to enjoy, though die hards have complained it was not Rosemary’s Baby 2: Dead and Loving It. This film seemed highly linked to the director's The Ghost Writer. Both films had protagonists whose livelihoods are based in books, and who get involved in intrigue due to the secrets those books hold. If you’re really into books, you’ll probably find the plot involving rare editions interesting. General horror fans might find the film interesting, but perhaps could do better too.